How many times have you walked by a good-looking artisanal cheese at the grocery store, thought about diving in, but ultimately didn’t have the guts? Maybe it had a weird rind, or you weren’t sure how to pronounce it, or maybe you’re still traumatized from that one time you mistakenly selected a really stinky cheese from a platter at a party. But it’s time to conquer your fears of the unknown! Whether you’re an aspiring cheese connoisseur or a seasoned curd nerd, odds are you may have never heard of Mantoro. That’s because Old Europe Cheese is the only cheese maker churning out wheels of this mysterious cheese. Okay, so what is Mantoro? 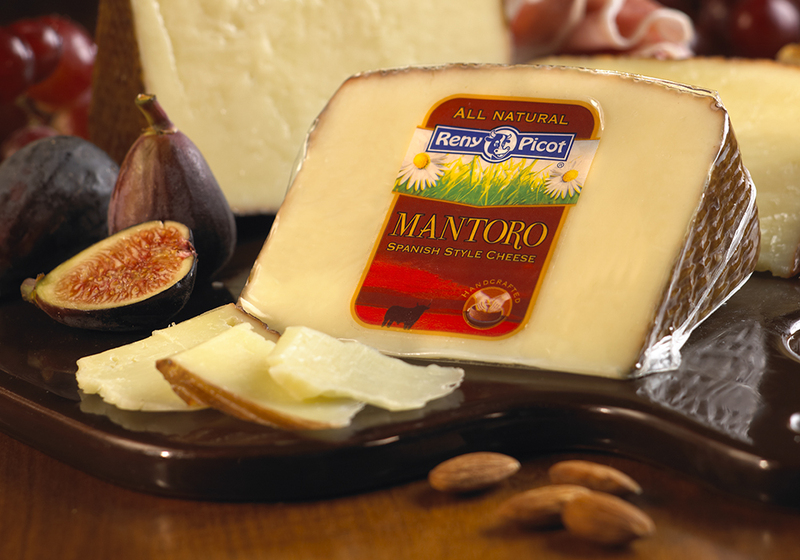 Reny Picot Mantoro, also known as “Michigan Manchego,” is (yup, you guessed it) very similar to the popular Spanish Manchego cheese. At Old Europe Cheese, we follow the time honored recipes handed down by Spanish generations. However, our domestic version of the national cheese of Spain is made from 100% pasteurized cow’s milk instead of the traditionally used sheep’s milk. If it’s so popular, why not just make Manchego? Yes, Manchego is Spain’s most famous cheese and is in fact world-renowned. But just like sparkling wine can only be called champagne if it comes from the Champagne region of France, the same principle is true for Manchego cheese. For a cheese to be labeled Manchego, it must be produced from the milk of the Manchega breed of sheep in the La Mancha region of Spain. Most cheese lovers are pleasantly surprised at their first taste of this hard, crumbly cheese. The creamy golden color and combination of flavors is a delicate balance of sweet and salty, and is generally tangy with a light nuttiness. The lasting sweetness combined with a distinct acidity that tingles as it melts on your tongue creates not only an intense flavor profile, but an invigorating experience. Why does the rind look like that? Reny Picot Mantoro has a distinctive flavor and an equally distinctive look. Its hard rind is impressed with plaited esparto marks along the sides, while the top and bottom have elaborate patterns left behind by the forms utilized in pressing the cheese. This distinguishing exterior is based on the traditional molds used to form Manchego cheese, which are typically made out of straw and flowers and imprint the rind with a zigzag decor. Don’t eat the rind—it’s inedible—but beneath that beautiful dark brown rind you’re in for a real treat. If you’ve been stuck in a rindy rut and are ready to try something new, Reny Picot Mantoro is a safe bet and a proven winner. Now that you’re ready to get out of your cheese comfort zone and discover the mystery of Reny Picot Mantoro, find it in a store near you. Also, if you have a favorite Mantoro recipe, let us know! Contact us today to share a recipe or if you have any questions for us here at Old Europe Cheese. We’d love to hear from you!